Why are companies being pushed to improve visibility along the supply chain? On some level, it comes from a desire to improve efficiency. Equally, though, pressure is coming from customers — both retailers and their end users — who want better information on the status of their shipments. They want to know the location of their package as near to real time as possible. Cloud-based technology collects enormous pools of valuable data, from individual cargo transfers to weather conditions and traffic patterns. Analyzing this information en masse can help companies streamline their operations and boost efficiency. “Process mining” data uses artificial intelligence and machine learning to provide transparency into processes and how effective they are in real world application. By collecting massive amounts of data, companies can better understand how something like a simple two-street route change can cut last-mile times by valuable minutes. Where does all that data come from? Historically, it’d be logged manually, either on paper or into spreadsheets and WMS portals. Now, IoT technology is helping make the process simple. For the uninitiated, IoT describes sensors, barcodes, QR codes, and other tracking methods and relay information to a software platform. The software processes and logs information in the cloud, where it can be then fed into Big Data analytics systems to generate advanced insights. IoT devices are critical to streamlining processes in warehouses, but they have value all along the supply chain. 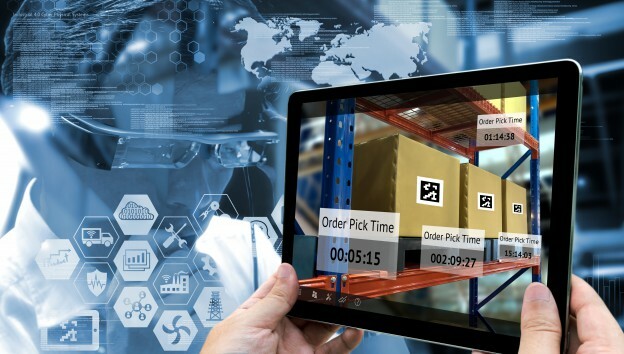 IoT also offers fantastic visibility for tracking product along the supply chain, as well as visibility into potential inefficiencies that shippers and warehousers can correct. IoT is super valuable for data collection, but it comes with its own set of risks. From necessary stakeholder training and knowledge gaps to cybersecurity issues, IoT still needs some work. However, for companies that use this current generation, the benefits are already apparent. Transferring freight between modes of transportation has been difficult for centuries. While technology has frequently made transportation and loading/unloading along one mode easier, intermodality still presents challenges. Fixing connectivity issues will be extremely beneficial for shippers, as freight trains offer an affordable solution for container transport that doesn’t require packing and unpacking of goods. Enter new technology designed to move containers direct from ship to freight train with ease (and track it better along the way). New Transportation Management Systems (TMS) are using IoT data to better track, schedule, and process goods as they travel across modes. For the end user, this offers unmatched insight into where their shipment is along the supply chain. New containers equipped with advanced tracking sensors (and temperature sensors, for perishable goods) make on-the-move tracking even more transparent. Ledgers have always been important for documenting shipments and offering a paper trail when things go wrong. Until a few years ago, a paper trail was something very literal, often in the form of handwritten documentation. Technology has digitized that process on some level, though issues with compatibility now plague the supply chain. One proposed solution is blockchain. Blockchain is a form of coded digital ledger used to document information in a way that can’t be edited or erased. Each product is assigned a specific code that follows it from the factory to the end user. This code is available for anyone to view, and once information is logged it can’t be changed later. One key problem blockchain evangelists encounter in the supply chain: implementation. In order for blockchain to work properly, there need to be industry-wide standards on software and coding best practices. That gets very difficult when dealing with logistics organizations from around the world, not to mention hundreds of individual companies. Only time will tell how blockchain can be effectively deployed to improve transparency. Want to learn more about technology that can improve visibility at the port and in the warehouse? Contact us!